Congratulations, you just got a new credit card with a great sign-up bonus! Now, comes the important part; you need to complete your minimum spending requirement within the specified time to earn that bonus. For some people, this is no big deal, but for many, this can be a daunting task. If your expenses are low you might be unsure of how you can meet that minimum spending requirement. Here are 32 ways to help you meet your minimum spending requirement without buying a bunch of extra stuff you don’t need. If you are a long time cash or debit card user, some of these ways might come as a surprise to you. What Doesn’t Count Towards Your Minimum Spending Requirement? Most merchants that accept credit cards do not have a minimum amount required at purchase. This means you can charge that 50 cent pack of gum if you want. You might get a sideways look from the cashier, but you will be one step closer to hitting your minimum required spend. Some establishments have a self-imposed minimum required to use a credit card. Often, if you tell them that a credit card is the only form of payment you have, they will let you use your card. Occasionally, they might stand firm with their minimum requirement, but it can’t hurt to ask. At service providers, like hair or nail salons, the business will have a sign indicating that tips are only accepted in cash. While it might be preferred to tip in cash, if they accept credit cards, they will accept a credit card tip. Similar to above, simply let the cashier know that all you have is a credit card, and they will often let you charge the tip to your card. Most credit cards that come with a hefty sign-up bonus also have a minimum spending requirement that you need to complete in a certain amount of time. The most common requirement is $3,000 in spending in the first 3 months after your account opening. So, for most cards, you will need to spend at least $1,000 per month to hit that target. Hot Tip: As soon as you get your new credit card, double check what is required to earn the sign-up bonus. The most common amount is $3,000 in 3 months, but this can vary so be sure to check your specific card. It’s also a good idea to mark this date in your calendar so you don’t forget. Do not wait until the last few days to hit your minimum spending. Sometimes it can take longer than expected for a charge to post, and you don’t want to lose out on your bonus because of bad timing. Groceries can be a large line item in most families’ budgets. 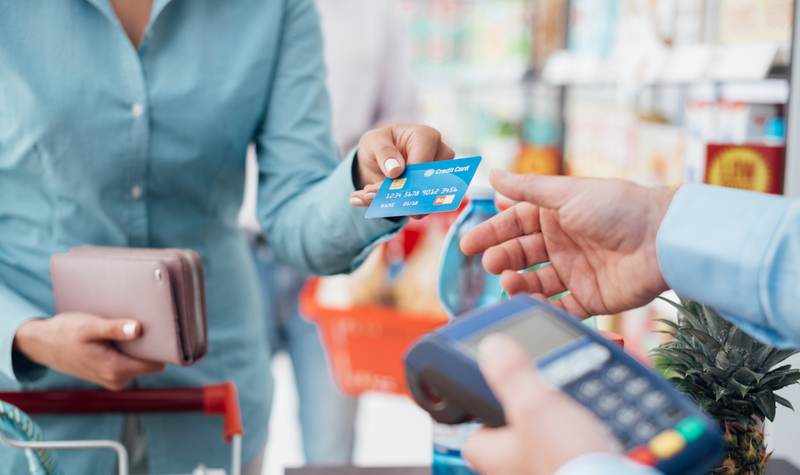 Paying with a credit card every time you are at the grocery store is an easy way to make sure you can meet your minimum spend. Yes, charge it even if you are only running in for a loaf of bread. If you are working on earning a sign-up bonus, consider stocking up on non-perishable items you use all the time. The USDA indicates that the average monthly cost of a family of 4 with moderate spending on groceries is $896.20. With 3 months of groceries, you’re nearly there! 4 Membership Rewards Points/$1 ($25,000 per year in purchases, then 1 point/$1). Terms Apply. Blue Cash Preferred® from American Express 6% Cash Back at U.S. supermarkets (limited to $6,000 per year in purchases, then 1%). Terms Apply. Blue Cash EveryDay® from American Express 3% Cash Back (limited to $,6000 per year in purchases, then 1%). Terms Apply. Here’s another easy one and an expense that most people have on a regular basis. Always charge it, and those dollars will add up to help you meet your spending requirement. Need toothpaste, paper towels, and kitty litter? Charge it all. Some store credit cards like the Target REDcard™ offer discounts when using their card. However, if you are trying to meet a minimum spend requirement, it’s advisable to put your store card away until you have earned the bonus. You can often have these things automatically deducted from a checking account, but you don’t earn any points that way. Set up all of these recurring charges on a credit card. Each month, your accounts will charge your credit card, and you will earn points. If you spend a lot on cable, internet, or phone charges, consider a card that offers extra points for charges in these categories. The Chase Ink Business Preferred℠ earns 3x Ultimate Rewards points on cable, internet, and phone services. Hot Tip: Set up all of your recurring bills like internet, cable and phone service to automatically charge to your credit card each month. It’s just as easy as having the charges come out of your checking account, and you will be earning valuable points when you use your credit card. Netflix, Hulu, HBO Go, Audible, etc. All of these things can be paid for with a credit card. If you already have automatic payments set up, move the payments to the card you are trying to earn the bonus on. It doesn’t matter if you’re sitting down to a 4-course dinner or getting a muffin at your local coffee shop; use your credit card to pay. This category is especially easy to earn bonus points too. There are lots of credit cards that offer extra points on dining purchases. 4 Membership Rewards Points/$1. Terms Apply. SimplyCash® Plus Business Credit Card from American Express 3% Cash-back. Terms Apply. You should always use your credit card on travel. In addition to earning points, lots of credit cards offer perks for travelers like trip insurance or airport lounge access. Travel is also a bonus category on lots of great credit cards so you can rack up points quickly when using your credit card for travel expenses. The Platinum Card® from American Express 5 Membership Rewards points/$1 on flights booked directly through an airline and travel booked through Amex Travel. American Express® Gold Card 3 Membership Rewards points/$1 on flights booked directly through an airline and travel booked through Amex Travel. If you travel for work, see if you are able to pay for the travel using your personal credit card and then submit the expenses for reimbursement. This is an ideal situation since you are basically earning credit card points for nothing! Even if you have a corporate credit card, you might not be required to use it. Check with your company for the specific policy. If you like to travel, you likely have plenty of trips planned at any given point. For things like hotels or cruises, you often don’t have to pay in full at the time of booking. But, if you have a minimum spend, pre-paying for upcoming trips can be a quick way to hit that minimum. You can also make partial payments towards your upcoming trip in whatever amount you need to hit your spending requirements. Any type of gym membership, fitness classes, yoga studio, or even online fitness classes can be paid for with a credit card. You might as well get healthy while you are earning those bonus points! The Chase World of Hyatt credit card even offers a fitness bonus category! This card earns 2 World of Hyatt points per $1 spent on fitness clubs and gym memberships; this can include things like yoga studios and even personal trainers. If you are a parent, you know how expensive kids can be. You might as well earn some points while paying for all of their activities. You can use a credit card to pay for anything from dance, swim, or soccer classes to private school tuition or daycare. 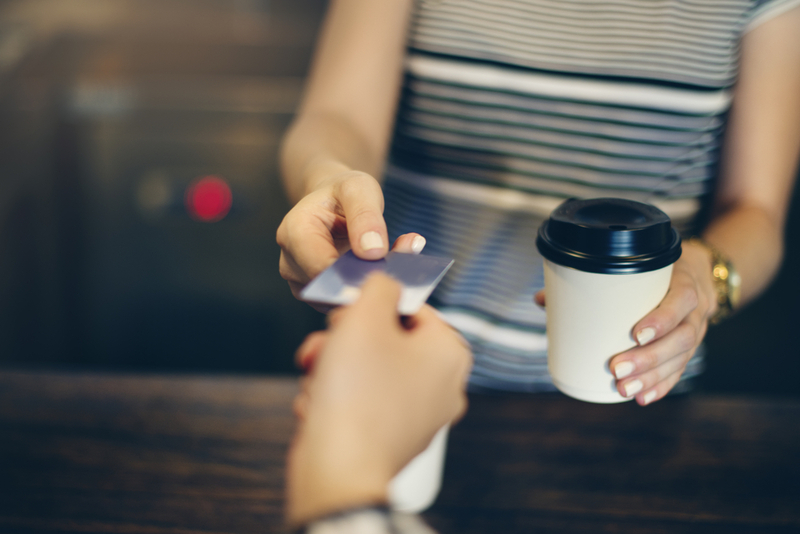 If you stop by your local coffee shop every morning for a quick caffeine pick-me-up, be sure to pay with your credit card; even if it’s only a dollar or 2. A $2 coffee, 5 days-a-week is $40 a month towards your minimum spend. Every dollar counts! Use your credit card even for small purchases like your morning coffee. This will help you hit your spending requirement fast. Image courtesy of Shutterstock.com. Grabbing a quick sandwich between meetings? Use your credit card. 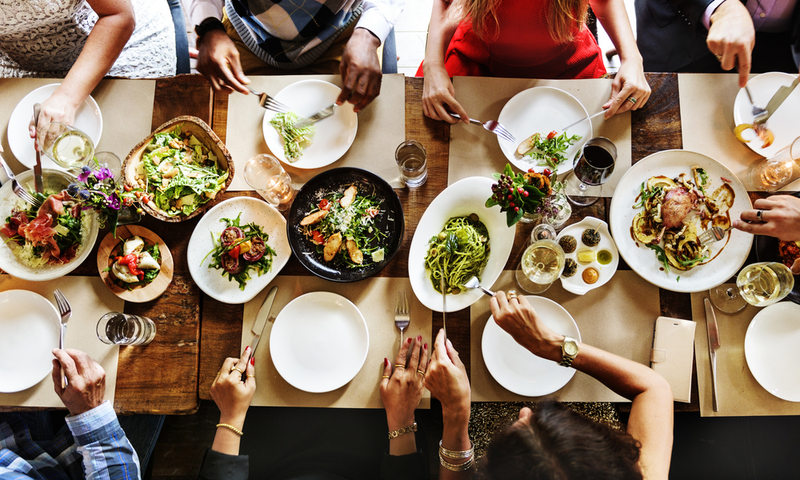 If you are eating with a group, you can offer to pay for everyone’s lunch on your credit card and have them give you cash. If you have birthdays or holidays coming up, go ahead and purchase some gifts early while you are working towards your sign-up bonus. You will earn your bonus quicker, and you will be thankful your shopping is done once that birthday or holiday rolls around. You can do good in your community or donate to a cause that’s meaningful to you with a swipe of your credit card. Not only are charitable contributions a tax deduction, but you get those points and help meet your minimum spend. The first question you should ask anyone that you’re considering hiring for remodeling or landscaping is, “Do you take credit cards?” While you may laugh at this, most contractors and landscapers take credit cards. Those points add up and you get closer to your minimum spend. If you need to hire a professional to do some work around your house, more often than not, they will take credit cards. So, next time you need a plumber, electrician, carpenter, or another service professional, be sure to ask if they take credit cards. If you are able to enjoy the luxury of having someone else clean your home, be sure to put it on a credit card if you can. Treat yourself to a fresh haircut, a massage, or a mani/pedi, and be sure to pay with your credit card. Often, these types of services ask for a tip in cash. However, even if they prefer a cash tip, you can ask to put it on a credit card too. More often than not, they will be happy to do it. Dry cleaning is a necessary expense for many people and can easily be charged to a credit card. Many dry cleaners are located within grocery stores and can be coded as a grocery store expense. That means you can often earn bonus points when using a credit card that earns bonus points on grocery purchases like the American Express® Gold Card. If you are in a hurry to meet your minimum spend, avoid buying things you don’t need. Instead, you can purchase gift cards to stores you shop at often like a gift card for a grocery store. If you are going this route, try to purchase gift cards from a store that offers bonus points to maximize every dollar you spend. If you have an Ink Business Cash℠ credit card, purchase gift cards at an office supply store to earn 5% cash back. If you have an American Express® Gold Card, purchase your gift cards at a grocery store to earn 4 Membership Rewards points per dollar. You can offer to charge purchases for your friends and family on your credit card. Then, they can give you cash to cover their expenses. This works well if you are out at a group dinner; offer to put the charge on your card and everyone can pay you instead of having everyone pay separately. If you are dining out with a group, offer to charge the bill to your credit card. Then everyone can give you cash or send a quick payment through Venmo or PayPal. Image courtesy of shutterstock.com. You can add an authorized user to your account who will get their own card. Then that person can charge their expenses on your card and the amount will count towards your minimum spend requirement. They can give you cash for their purchases or send a payment through a service like Venmo or PayPal. Since you are ultimately responsible for all the charges made by your authorized user, only do this with someone you trust. Utility bills are something that most people pay for by check. However, you’re likely able to pay for these bills using a credit card. Sometimes there is a small fee, but if you are working towards a minimum spending requirement for a sign-up bonus, it can be worth it. In a perfect world, everything could be paid for by a credit card. But the reality is that there are many large expenses like rent, a mortgage, and taxes that can’t be paid by credit card. Plastiq is a service that allows you to pay for these types of expenses with a credit card regardless of whether or not the vendor accepts credit cards. There is a catch, though. Plastiq charges a service fee of up to 2.5%. However, in some situations, the bonus points earned can outweigh the fee charged by Plastiq. If you are putting friends’ charges on your credit card, PayPal is an easy way for them to pay you back without having to deal with cash. You can also send payments through PayPal via a credit card, but there are fees involved. PayPal charges a 2.9% fee plus an additional fixed fee based on the currency you are using. It’s good to know this is an option, but it’s probably only a good idea in very specific situations. Venmo is another easy way for friends to pay you back without having to deal with cash. You can also send payments with a credit card. This feature does charge a 3% fee so it’s not something you want to do with regularity. But, in some circumstances, it could be worth it. If you want to get really creative, you can get into the reselling business. This involves purchasing items and reselling them on sites like eBay or Amazon. This doesn’t come without risk, though, so be sure you know what you are getting into before you get into the business of reselling and that you abide by any state laws. If you run a small business, you can put business expenses on your personal credit card if you need to hit a minimum spend requirement. While this might make your accounting a bit more complicated, it can be a great way to earn a sign-up bonus quickly. It’s no fun to pay for car repairs or maintenance, but it’s a necessary expense. So, put those charges on your credit card, so at least you know you are getting closer to earning that sign-up bonus. Dirty car? Run it through the car wash and charge it. If you sell items on eBay, you know that there are fees associated with selling. You can have these fees taken out of your earnings, but a better option is to opt to have those fees charged to a credit card. It only takes a minute or 2 to set up and you will be on your way to earning more points with your credit card. As you can see, there are tons of ways to hit that minimum spend requirement on your new credit card without purchasing a bunch of stuff you don’t need. One important thing to keep in mind is that you should not charge anything on your credit card that you can’t pay off at the end of the month. Interest charges and fees not only damage your credit score, but they offset any benefits you are getting from your points. Does adding an authorized user count towards a minimum spending requirement? Yes, any charges your authorized user makes will count towards your minimum spending requirement. Then your authorized user can pay you in cash or though a service like Venmo for their purchases. Since you are responsible for your authorized user’s charges, only add someone you really trust. Does an annual fee count towards a minimum spending requirement? No, any annual fee you may be charged for your credit card will not count towards the minimum spending requirement needed to earn a sign on bonus. You did not mention a way that I use when required to meet minimum spend requirements; pay your estimated taxes to the IRS. The minimum charge for doing this is 1.87%; with many cards paying rewards of 2% or more you actually can earn money. If you need it, the IRS does not care if you pay more than your estimated tax for a particular payment and you can make up for it by spending less on your next payment; Additionally, you get the float when you pay the IRS by credit card. One other addition: Cable companies and Phone companies never care if you pay more than your monthly bill. They will just give you a credit which will disappear on a month by month basis. If you are getting a card which defers interest on charges for some time, you can make minimum payments until all is back in balance. So, basically you should just buy anything you have to buy with a credit card? This list is literally pointless. It’s “anything you buy” buy it with a card for max points. Hi Andrew. Actually, the article is about meeting the minimum spending requirements when you first apply for a credit card. You must spend a certain amount, usually within the first 3 months after you’re approved for a card, to secure the initial welcome bonus. It may not be obvious to think of paying your utilities ahead, for example, or pay car insurance with your card, therefore the intention of the article. This is not the same as earning maximum rewards for just spending but ideas on how to meet those spending requirements for that up-front bonus.